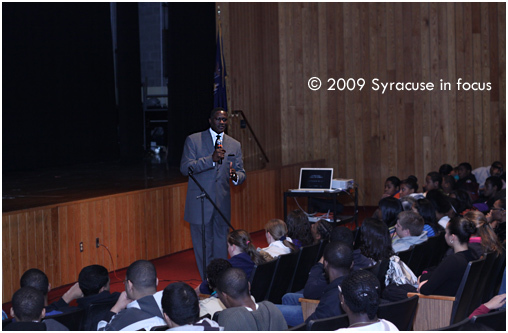 Retired NBA player Dominique Wilkins visited Syracuse’s Fowler High School today to talk about diabetes management and prevention. “How many people in here have a family member who has diabetes, ” Wilkins asked. Almost every hand went up in an auditorium of a few hundred. He was diagnosed with Type II diabetes one year after he retired from playing in the NBA. Wilkins, who is most known for his thunderous dunks, is currently traveling the nation as a Diabetes Awareness Ambassador for Novo Nordisk. 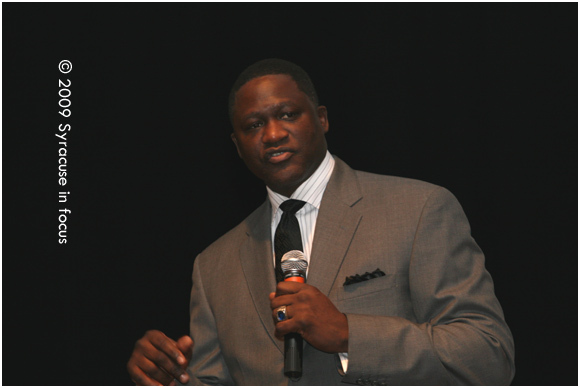 He stressed he importance of establishing healthy eating habits, regular exercise and knowing your family health history. Who is better Kobe or Lebron: Kobe is the most complete player in the league. Who was your idol: Julius “Dr. J” Erving. The first time I played against him he scored 38 on me and I wasn’t upset.